BAYSVILLE, ON – Lake of Bays Brewing has announced the launch of two new brands – one an addition to the brewery’s year-round line-up, and the other filling a previously empty slot in a quarterly rotation of seasonal beers. Paying homage to the pioneers who carved roads and rails into the rugged landscape of the north, we handcraft this golden lager using select noble hops and premium Canadian malts. True to its style, this lager pours with a rich golden colour and delicate white foam. The bouquet includes gentle notes of fresh cut grass with a touch of breadiness and the most subtle hint of caramel. There’s a slight sweetness at the start but it quickly changes to crusty bread flavours. The finish is clean and crisp with a nice dryness. Overall, very refreshing, smooth and well balanced. This uniquely refreshing ale arrives with a brilliant golden hue. The foam is white, creamy and very dense. Aromatics are soft and fresh, with freshly-grated ginger and a hint of lemon drops that becomes more apparent when the beer warms slightly. The body echoes the aromas, with spice and citrus on the forefront and just a wisp of crusty bread. Mouth feel is balanced, with a crisp finish in which in which the citrus and spice characteristics remain. 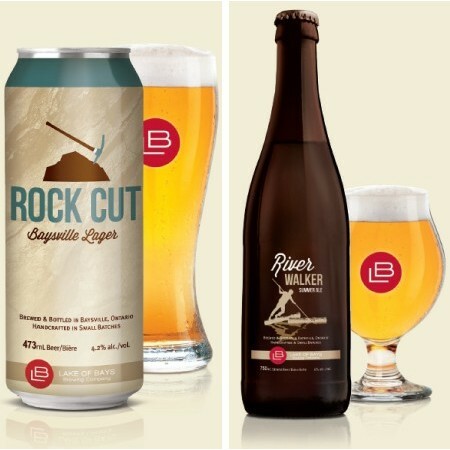 Rock Cut Lager is available now at select LCBO locations throughout Ontario and at the Lake of Bays retail store. River Walker Summer Ale will be released later this month with similar distribution.